If you’re looking for a handy place to store your sneakers, we’ve compiled a list of 24 DIY shoe rack plans. There are a ton of different styles to choose from- vertical column racks (#16), ladder racks that attach to doors (#5), cardboard cubbies (#8), the obligatory recycled pallet wood rack (#7) and even a leather PVC sling build (#14). These are simple woodworking projects- a great beginner project if you’re a novice carpenter. Scroll down to check out the builds and click the ‘View Plans’ button to check out the free plans. Materials for this DIY project include pine, plywood, wood glue, nails, paint, and sandpaper. An accompanying video tutorial helps to ensure novices and experts can both recreate this at home. If you don’t have power tools, you can get Home Depot to cut your wood to size for you. 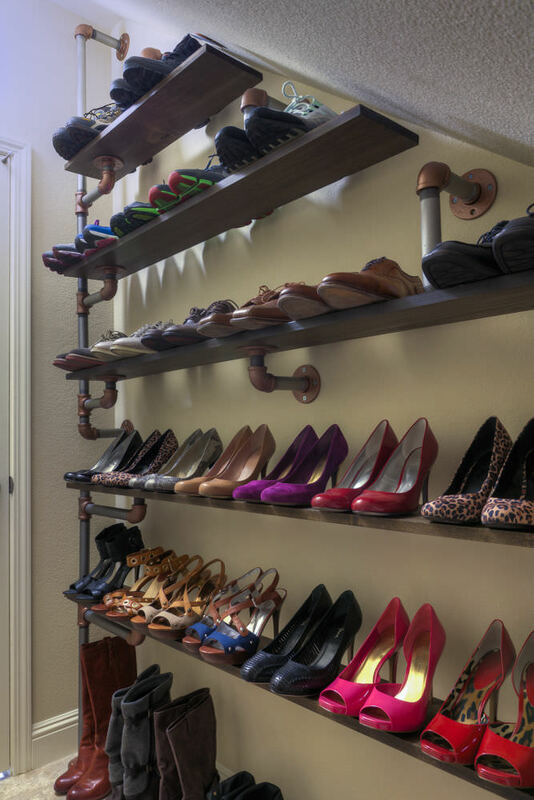 This shoe rack aims to be a little creative and add a unique touch to the room. To make this, you’ll need sandpaper, a jigsaw, a router, paint, and long wooden dowels. 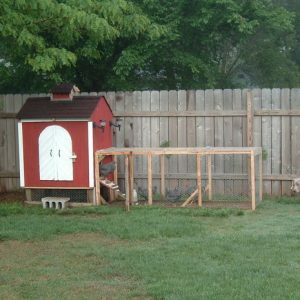 You can use your own design or follow along with this builder’s plan. After you have your design, round off the edges, paint it, and began assembly once the paint is completely dry. This holds around six pairs of shoes, though you can alter the measurements to make it larger or smaller. 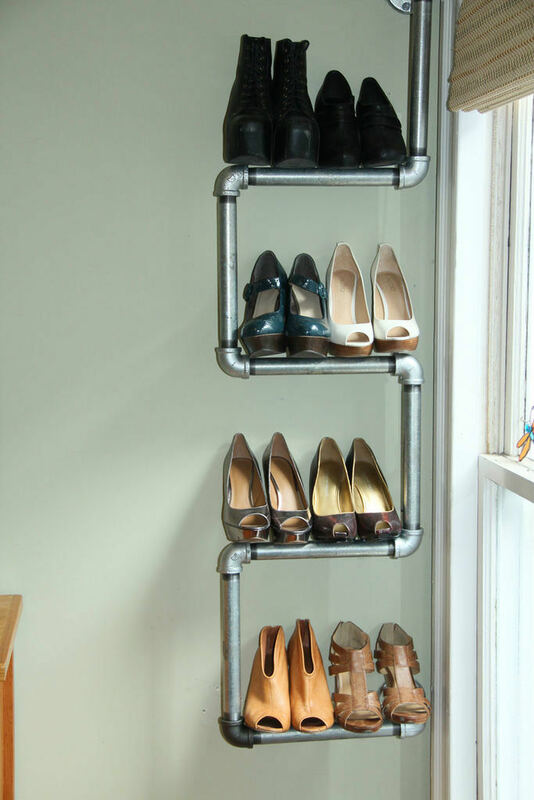 Inspired by a ladder, this rack is an optimal use of space — if shoes always end up piled up in the corner of your home, this is the perfect DIY idea for you. This designer used redwood, wood screws, brass brads, and a power drill to put everything together. Install the vertical supports, then the horizontal slats, add the top row, and add any finishing touches. Once assembled, you can easily spray paint this or polish it before stacking your footwear here. 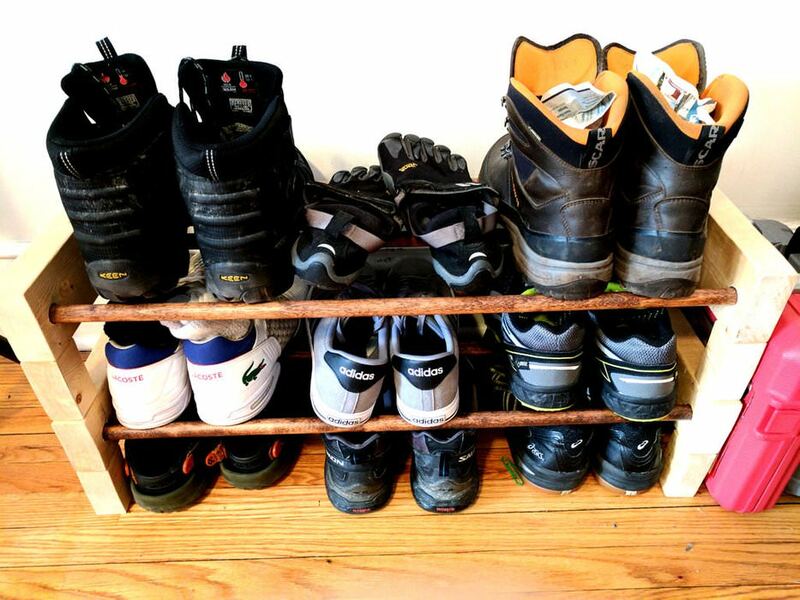 This wooden rack completely organizes all of your shoes, sneakers, and boots. Each of the cubbies is a slightly different size, ensuring all types of shoes can fit inside. Materials required include wood glue, brad nails, a table saw, clamps, and wood of your choice. Once your lumber is cut, follow your blueprint to the letter and begin assembly. This project only takes a few hours to complete and doesn’t require any special carpentry skills. A sturdier and more appealing version of plastic over the door storage solutions, this should provide storage for all of your shoes. 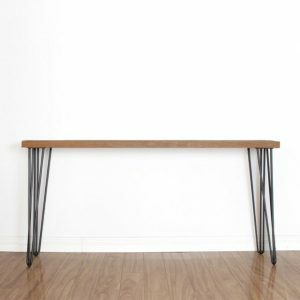 It is important to drill your horizontal slats with correct spacing, otherwise, the shoes won’t sit at an angle and fall each time the door is opened. Simple drill the base, install the dowels, attach the brackets, and you have a new shoe rack. If for some reason you can’t hang brackets over your door, you can drill this directly into it. Perfect for adults or children, this rack spells out the word shoes. To make this, you need medium density fiberboard, round wooden sticks, power drill, and hand saw. Simply print out a stencil (using whatever font you like), cut out the letters, drill the holes, and put everything together. Painting this would really make this stand out and you could use a different color for each letter. You can also vary the spacing of the letters for larger or smaller shoes. 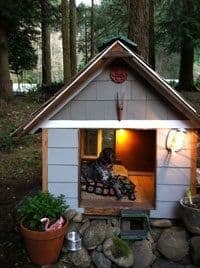 If you happen to have an old pallet in the garage, you can take it apart and not have to buy any wood for this DIY plan. You can sand, paint, or leave the wood as it is. Screw the pallets together, make a shelf, and add supports. Some materials you’ll need for this include an electric screwdriver, hammer, fixit blocks, and sandpaper. This gives a great rustic look and feel to your home. Who doesn’t have boxes from Amazon packages lying around the house? Well, you can make a shoe rack using those, along with packing tape, scissors, and a ruler. To begin, figure out how you want to arrange all of your boxes and strengthen the base. You can use actual wood or use two strong boxes doubled within each other. Then, tape or glue everything together, attaching it to the base. You can paint this a solid color or simply leave it as is. 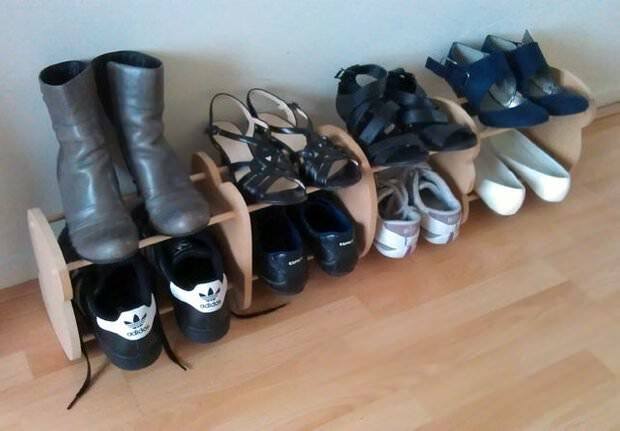 This is a basic shoe rack with a clean and modern aesthetic. 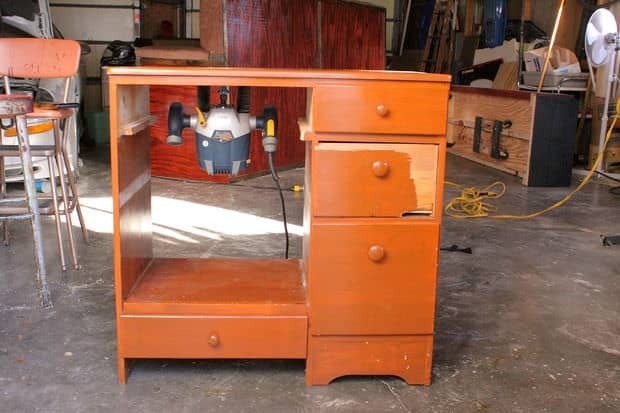 To make this, you’ll need medium density fiberboard, a metal rack, paint, power drill, and a router. Once you have your supplies, sand and round the edges, paint everything, and begin assembly. You can drill this directly into the wall or make a pocket hole with a mounting plate for a seamless look. This is an easy DIY project to follow, taking only around five hours to complete. PVC is an inexpensive and strong material that could be perfect for this DIY plan. All you need to make this is a miter saw, permanent marker, measuring tape, and PVC pipe fittings. 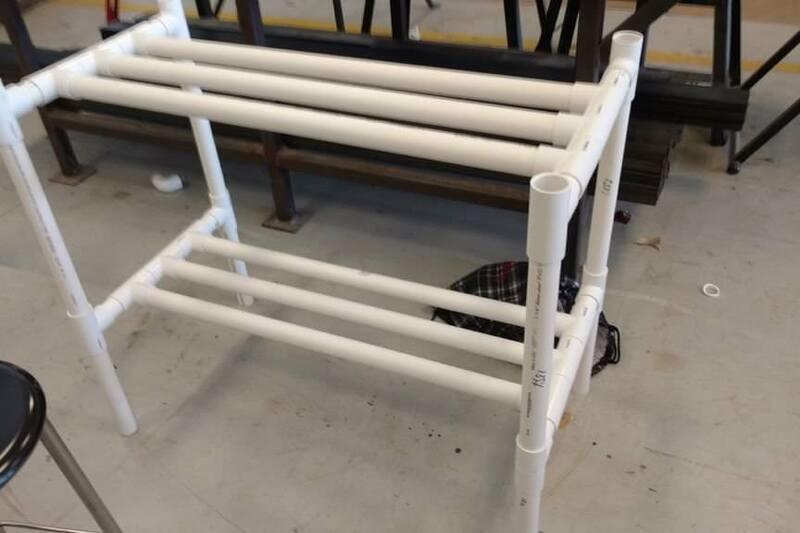 Simply cut the pipes to the measurements given and follow the exact assembly instructions to make the base and shelves. Slightly industrial looking, you can paint this or leave it white. You can also buy more PVC and make additional shelves or longer ones. This is about half the size of a normal rack and perfect for storing around six pairs of your kid’s shoes. Materials required include wood glue, furniture screws, wood stain, clamps, a jigsaw, furniture board, and a power drill. First cut the boards, then chamfer them, pre-drill your holes, and do a loose assembly to make sure everything connects properly before painting. Once the paint and polish are dry, you can connect all the pieces together. 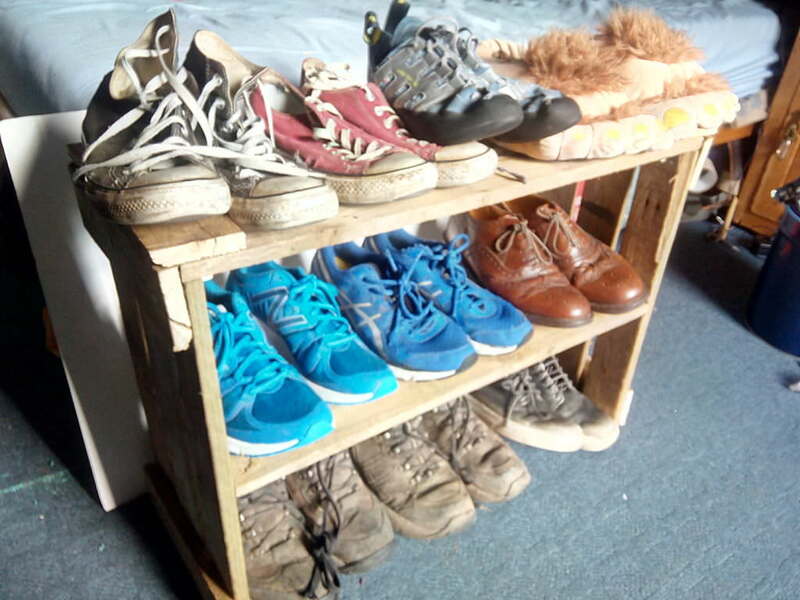 Inspired by factory days of old, this creative DIY plan gives you a way to display your footwear in style. You can start by measuring the area you wish to hang this. Once you have all your pipes, connectors, and flanges, you can spray paint them. 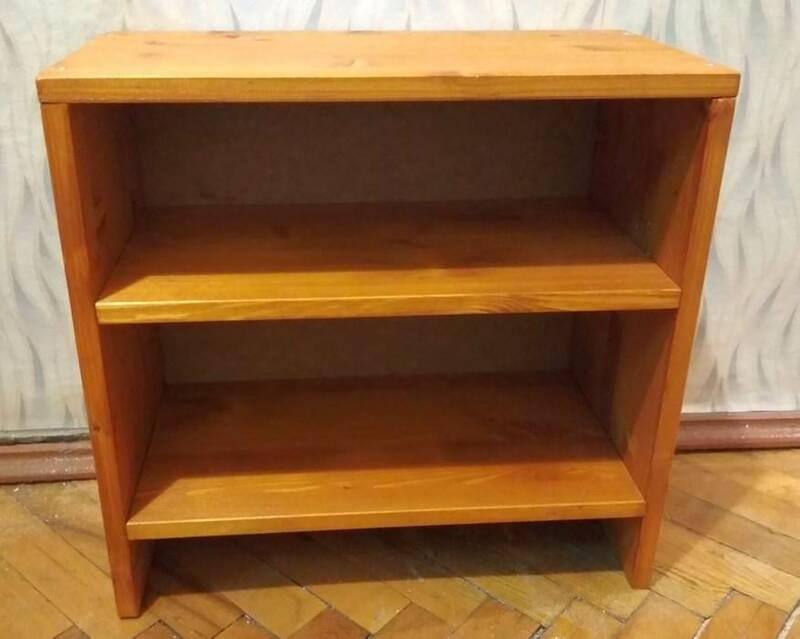 You can also stain or polish the pine used for the shelves. Wait until everything is dry and begin screwing into the wall. Drawing a blueprint is definitely useful, or you can layout your pieces on the floor to plan your design. 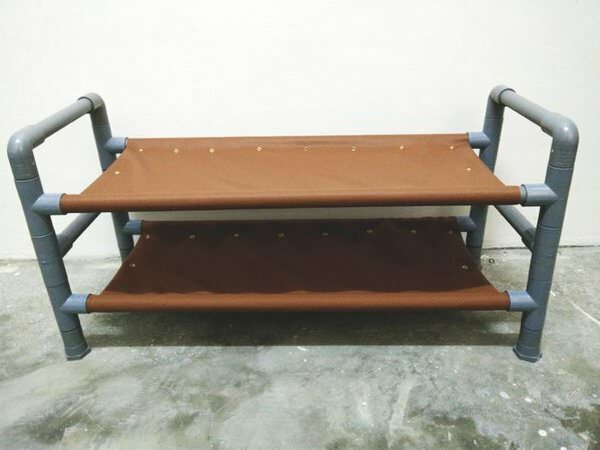 This rack only requires four supplies – a wire rack, screws, end caps, and a piece of wood. First bend your rack, then add the end caps and begin mounting to the wall; you may need to use a stud finder. You can make a few of these right on top of each other, as each one holds about four pairs of shoes. 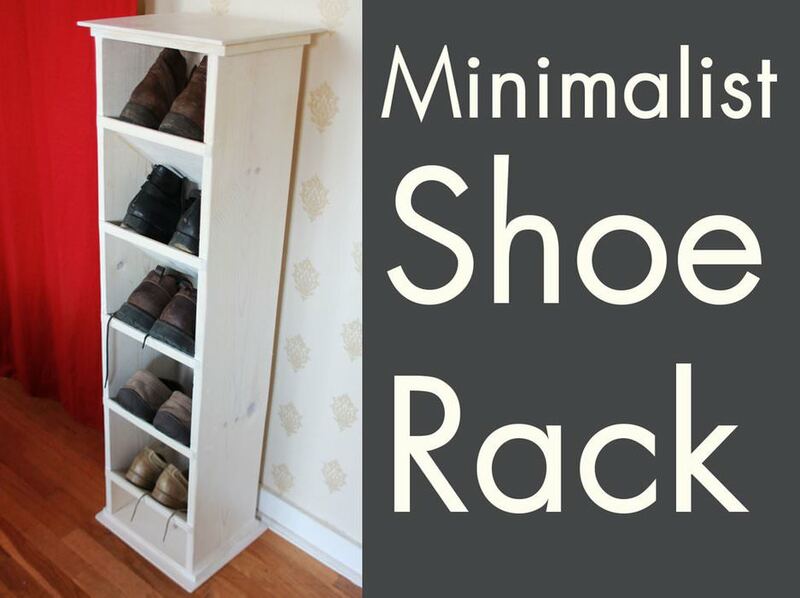 Perfect for inside closets, this frees up floor space and is much cheaper than buying a shoe rack. This DIY project also uses PVC pipe, though adds some creative touches. To make this, you’ll need faux leather, brass eyelets, a saw, PVC fittings, and a leather hole punch. Cut and assemble the pipes before preparing the leather covering. The exact dimensions and places holes should be punched are given though you can use your own measurements. Simply dismantle the bottom bar and slip this cover on. This enables you to change out colors of this and clean it very easily. Supplies needed for this project include poplar, wood glue, dowels, a hacksaw, clamps, and a power drill. A helpful charts documents all the cuts you need to make on the wood. Then, pre-drill holes, assemble the uprights, install the base, add the crossbars, and you’re finished. Feel free to paint or polish this or leave it unfinished for a rustic look. 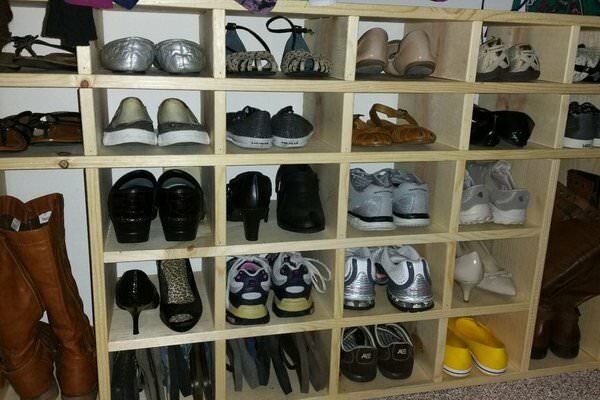 You can hold your entire shoe collection here and always adjust the number of shelves you’ll make when building this. Primarily composed of 1x2s, this is a very inexpensive and easy DIY plan to follow. Simply cut your wood, assemble two “ladders”, put them together, and begin styling. 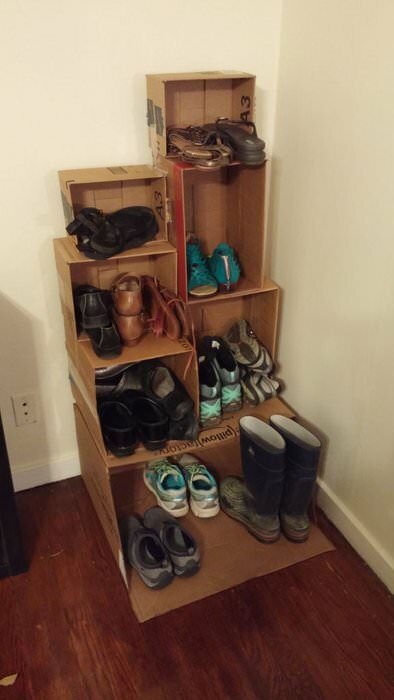 The finished product should hold six pairs of shoes. Depending on where this will be placed, you can design the dimensions around the space in your home. Although the instructions are a little vague, this isn’t complicated and even novice builders should be able to make this. This is another easy to follow DIY blueprint. To make this, you’ll need a wooden pole, wood glue, 2x4s, a power drill, paint or stain, and sandpaper. 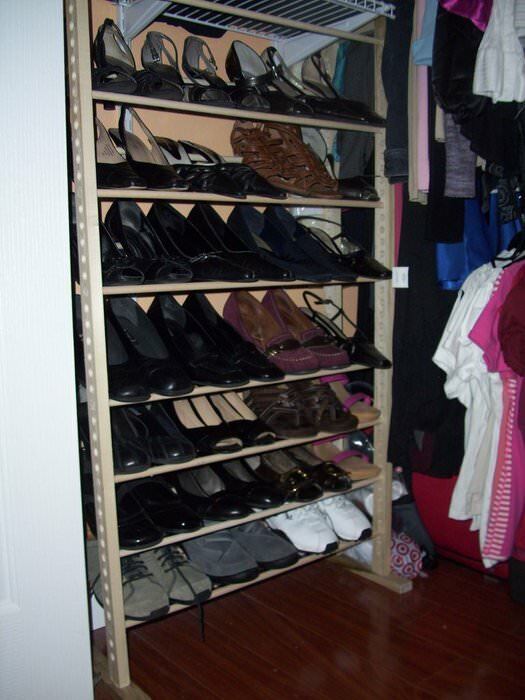 Once you have the pole, make the sides of the rack, assemble them, and you’re ready to start stacking your footwear. Although a very simple concept, you can fit up to nine pairs of shoes on this small rack. You can also get creative with the type of wood you use. If you have an old shoe rack that wobbles or is on its way out, there’s no reason you take it apart and reuse some of the pieces. If you’re following this DIY pan, you’ll need a table saw, pocket hole jig, power drill, plywood, and finishing oil. Fix the wood together, fit the metal tubes, and add any finishing touches. 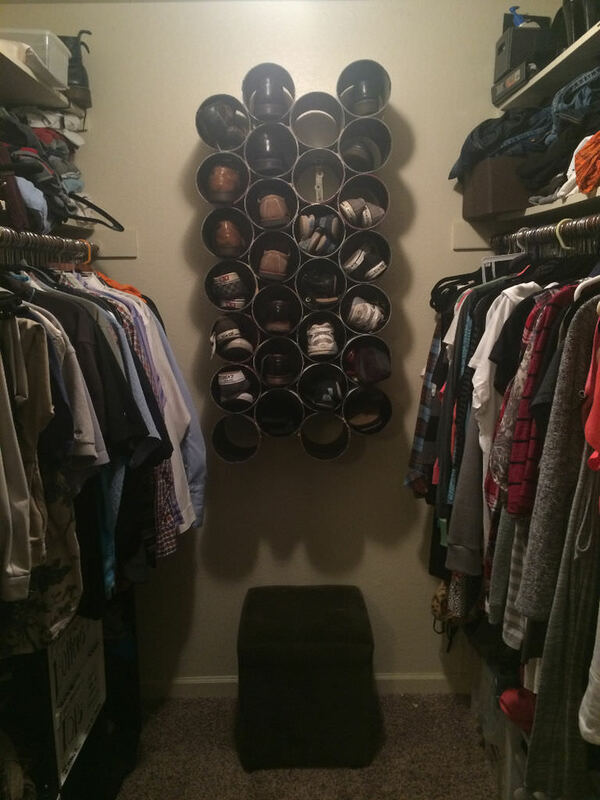 You can paint this whatever color you like and even add hooks to hang clothing on the sides. 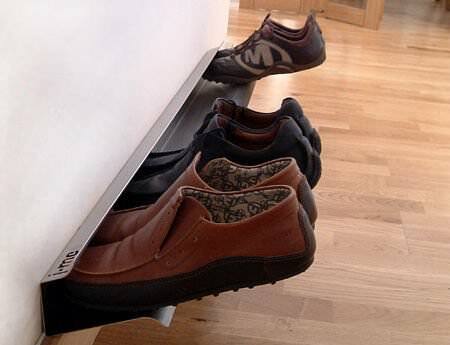 A creative storage solution, this allows you to keep floor space and easily pick out your footwear in the morning. You’ll need Gorilla Glue, drainage pipe, clamps, a hacksaw, and metal brackets. The length you cut the pipe can be up to you — just check to make sure your shoes will fit inside. It is also a good idea to sand the edges where you cut so you don’t get caught on any jagged edges. Industrial, minimalist, and chic, this combines two storage needs. Using flanges, wood screws, pipe elbows, a hand drill, threaded pipes, and drill bits, you can make this yourself at home. Mount the flange to the wall, attach the pipes, mount the other flange, and you’re done! You can display a variety of things here, from shoes to books to CDs and records. 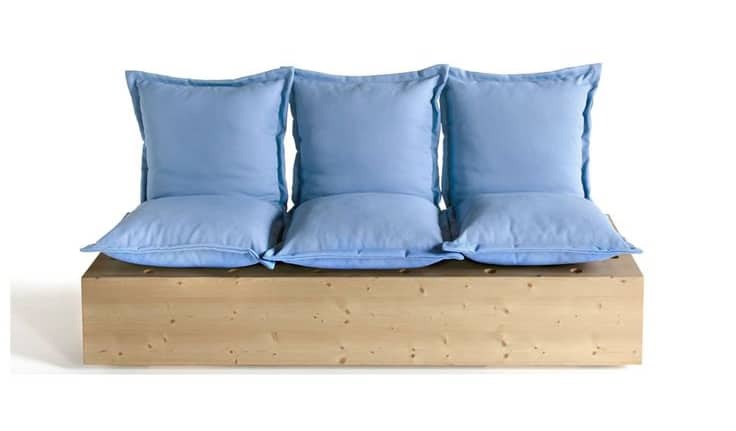 You can also customize this to fit the exact dimensions of your space. 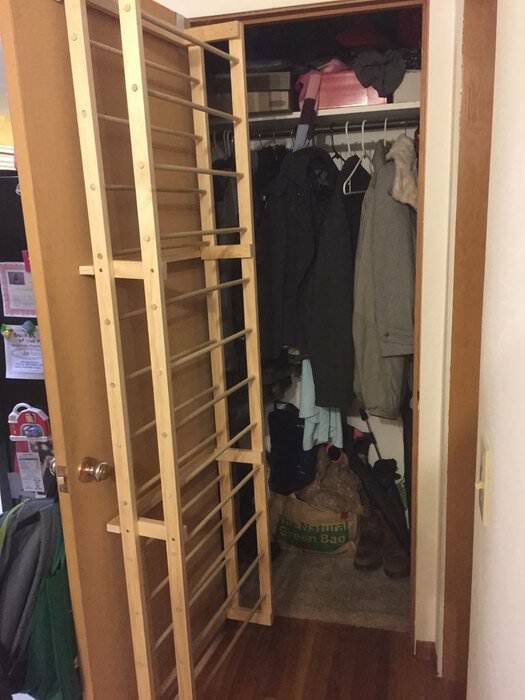 Reddit also has a variety of options- things like floor to ceiling builds, cedar shoe blueprints, cabinets, cardboard styles, carousels, horseshoe boot racks, plastic bottle styles, shoe box ideas, nail polish rack styles, barbie shoe rack, bamboo racks, baby shoe racks. 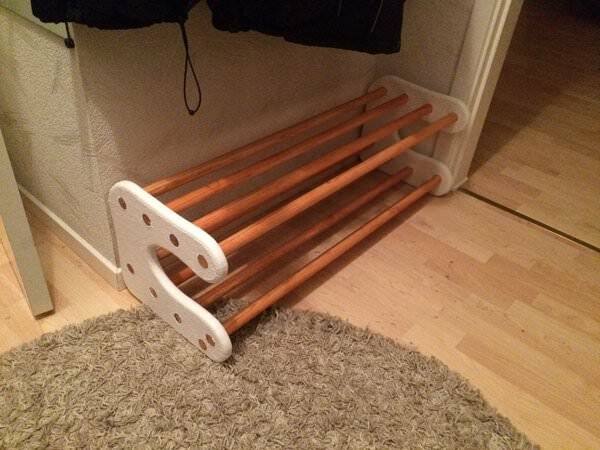 Over in Reddit, one poster in the do-it-yourself community published a tutorial displaying a combination bench, coat and shoe rack. It’s a handsome option that sits inside a small space by the front door, offering some pegs to hang up your coats, a bench platform for sitting and removing your shoes, as well as an underside storage area to tuck away your footwear. One user had a smart suggestion- he said it would be a good idea to add a plastic tray beneath the shoe holder so that when winter rolls around and your snow boots are leaking dirty snow the tray will collect all of that water so it’s easier to clean up. 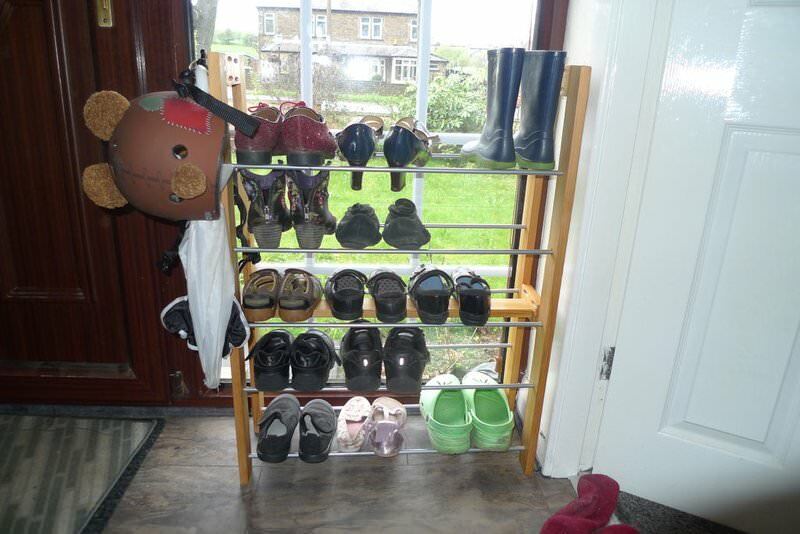 Another user said that this is more of a hall tree project than an actual shoe rack one, but they loved it all the same. Another user praises the combination of wood and black metal- saying that the original poster did a good job welding the materials. In terms of materials, this metalworker said that all he needed to get started were some safety gloves, a welder, an angle grinder, and a mask- all of which he purchased from Harbor Freight for around $200. 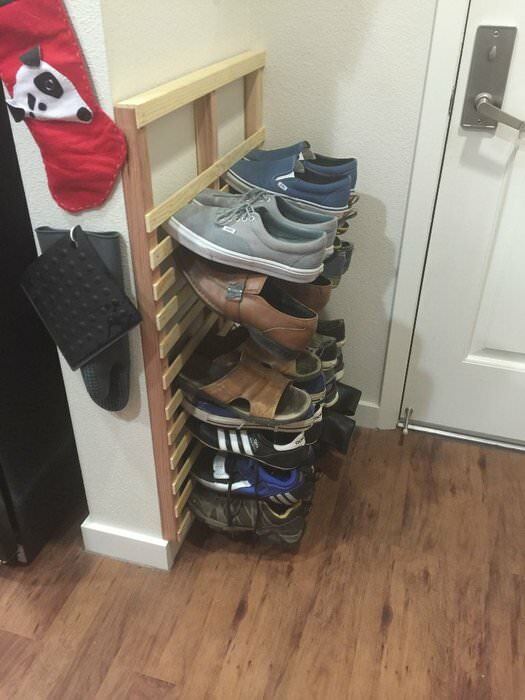 Another do-it-yourself project we saw on Reddit was a custom, pdf height adjustable shoe rack shelf. This wooden cubby storage solution sits beside a couch just inside the doorway, offering a convenient place to store flip-flops, high heel shoes, wedges and running sneakers. The Reddit community was pretty impressed saying that it is a simple and functional option that looks easy to build and is a great storage space saving solution. 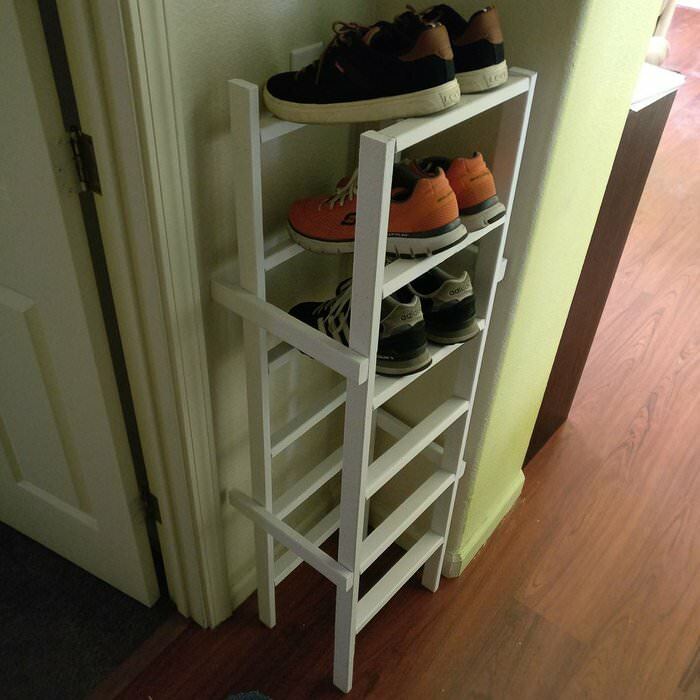 Another Reddit DIY post that we enjoyed was submitted by a user who showcased a unique looking shoe rack constructed from scrap plywood. 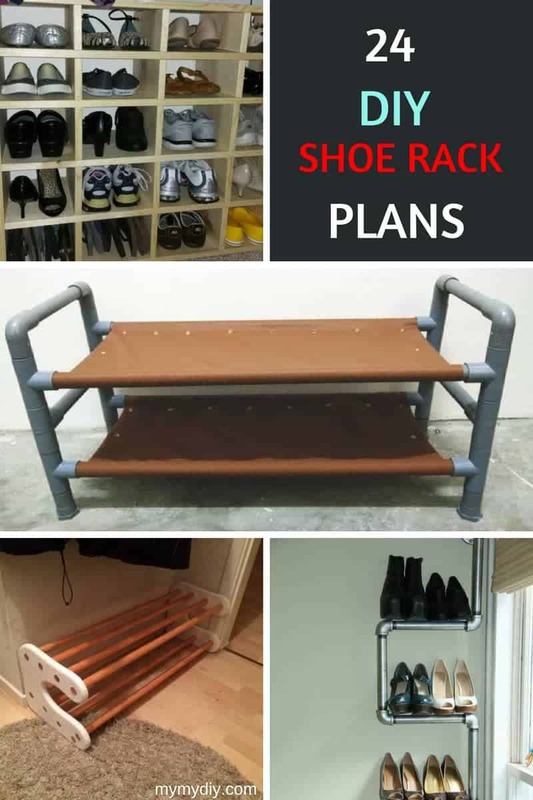 Another poster showcased a shoe rack example with metal poles forming the rack portion. It has three tiers so that you could stack backpacks and other gear on top, while also talking smaller footwear beneath the bottom rung. Reddit was impressed but said that given how complex this looks to create it might be worth going to IKEA and purchasing something ready-made, sparing yourself the aggravation. 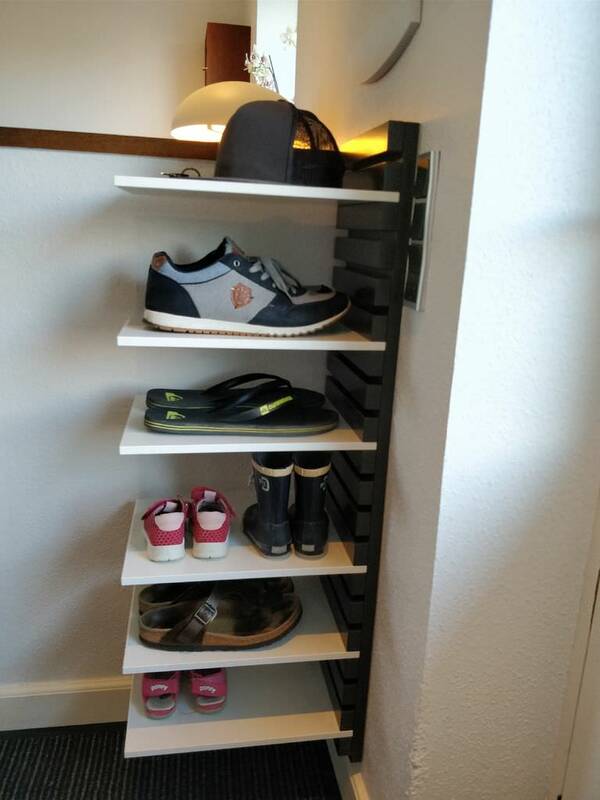 Another option we saw was a vertical tower shoe rack tower that is pretty narrow, which might be a good option if you don’t have the space for a wider build. The cubbyholes can be adjusted to the height you need- in this case the builder showcases how you can store belts inside a small cubby space, though he did say it doesn’t accommodate his work boots, which he generally stores in the garage anyway. 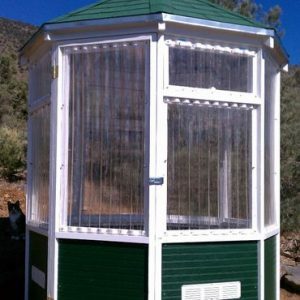 If you end up building one of these, shoot us an email and we’ll consider featuring your plan on our website!